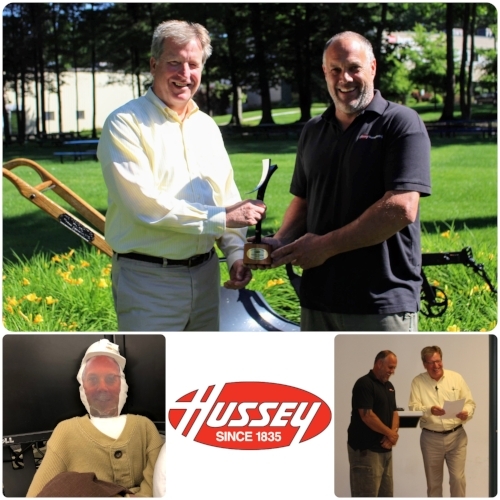 The Timothy B. Hussey Achievement Award replaces the previously named Chairman's Award as of 2017, but the message remains the same; to honor an outstanding employee who demonstrates exceptional performance, outstanding leadership and/or a significant contribution to enhance the present well-being or future of Hussey Seating Company. Congratulations to Ken Burgess on your outstanding achievements! Ken is Hussey Seating's Installation Supervisor & On-site Safety Coordinator and since returning to the company five years ago, Ken has been the face of Hussey Seating at project installations, product demonstrations, and sales calls. He is known by anyone who works with him as truly an expert in his field. His expertise is sought after externally by dealers and independent installers regardless of the time of day. Customers reach out to him directly for operational issues and to request parts for configuration changes. Internally, Ken’s one hour stops into the office frequently become four hours when the word gets out that he’s here. “Let’s ask Ken” is a common phrase among engineers, project managers, customer service and others. When Ken talks, people listen (and not just because he speaks loudly!). Ken's colleagues missed him so much at company events they bring "Little Ken" or "LK" to events so he can feel like part of the gang while he's on the road. You'll often find "Little Ken" hanging out with the Major Projects team at BBQ's and participating in the annual Hussey Games. Ken’s commitment to Hussey Seating Company and its customers is outstanding. His work ethic is unparalleled; his commitment to “doing whatever it takes” to get the job done right and on-time is evident day in and day out; and his professionalism and knowledgeable presence in front of customers represents Hussey extremely well. Ken is respected by customers, general contractors and subcontractors for the way he navigates a job from start to finish under very aggressive schedules and often challenging site conditions. “That’s impossible” is never in Ken’s vocabulary and this attitude has converted many customers to big Hussey fans”. Our customers always appreciate when Ken has worked the installation of their project, provided maintenance or service, or returned to re-train their staff. Their feedback is they love Ken and his high level of customer service. He represents Hussey in a true “family-owned company” fashion. Ken has a way of envisioning the complete picture when he starts out on a new installation and is quick to get a read on everyone and everything. He never takes shortcuts or compromises on quality to get a job done sooner and at the same time, he never misses a deadline. He accomplishes this through shear will and determination; accepting no excuses and showing little tolerance for the mediocre. His standards are high and he expects the same of others. Ken has worked as the installation supervisor this past year on several high-profile projects including the United Center, McCormick Event Center and BB&T Arena. At the same time, he was a mentor for our new supervisor, Rodney Ford on Vivint Arena and Kansas City Convention Center and spent more time reviewing the work of independent installers and troubleshooting problems to ensure work was done to Hussey’s latest projects to his high standards. Congratulations Ken and thank you for all that you do!